AppMakr, a service that makes it easy to generate your own custom, native iPhone application, has closed a $1 million seed round. The round includes angel investors and VCs: Mitch Kapor (founder of Lotus), Bill Lee, Rich Chen, Charles River Ventures (George Zachary & Bill Tai), Brian McClendon (angel, VP of Engineering at Google), Kima Ventures (Jeremie Berrebi & Xavier Niel), Warren Hellman (previously at Lehman Bros), Ben Narasin (TriplePoint Ventures), Pietro Dova, Sean Glass (Top Floor), Transmedia Capital (Chris Redlitz & Peter Boboff, of Kicklabs incubator). We’ve written about AppMakr a few times in the past — the startup launched in early 2010, allowing users to put together an iPhone application with a surprisingly small amount of work involved. COO Daniel Odio says that applications built using AppMakr now represent around 1% of the apps on the App Store — or around 3,000 applications. Earlier this year, AppMakr and the rest of the services in this space faced a new obstacle: Apple itself. As the huge number of submissions to the App Store continued to grow, Steve Jobs and company decided to start cracking down on so-called ‘Cookie Cutter’ applications that were excessively generic and didn’t offer much more than a glorified RSS reader. AppMakr dealt with this by establishing an “App Quality Index”. When you build your application, AppMakr will analyze the likelihood that it will be rejected by the App Store review team based on the thousands of AppMakr apps that have been submitted in the past (it analyzes things like the number of tab options your app has and how much content they include). If the likelihood of being accepted is too low, AppMakr will tell you to improve the app before you can submit it to Apple. Odio says this has been a collaborative process with Apple, and that it’s worked well so far. One reason why AppMakr has gained such a following is its price tag: it’s free. When it launched in January it had a flat fee-based model, but the company has now gone fremium, where you can build basic applications free of charge with a variety of premium upgrades available. These premium upgrades include push notifications and the ability to convert your Ning Community into an iPhone app, and there are more features in the pipeline. 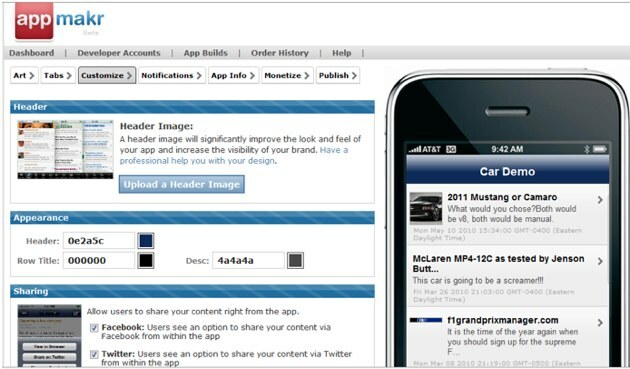 AppMakr is actually part of PointAbout, a consulting firm that builds custom iPhone apps for major brands like Disney. PointAbout has around 28 employees in total, but the majority of them work in the consulting arm — the AppMakr team is around eight people. Another popular startup in this space is Mobile Roadie.